Natural and organic beauty products have come on in leaps and bounds. A Decade ago, chemical-free products went off in a matter of days, felt greasy on the skin and were unappealingly colourless. Happily, those days are behind us—which means detoxing your beauty cabinet doesn't mean compromising on quality. As our skin absorbs 60 per cent of the substances we place on it, what we put on our body is just as important as what we put in it. It's important to differentiate between natural and organic; Organic beauty means no toxic chemicals, parabens, synthetic fragrances, nano particles or animal testing. Natural beauty encompasses any products made up of non-synthetic ingredients. Got it? Good. We round up some of the best organic or natural beauty brands below, none of which are tested on animals. Originating from Australia, The Beauty Chef is all about achieving beauty from the inside out, offering organic tonics and powder supplements made with probiotics, prebiotics and superfoods for a healthier gut. 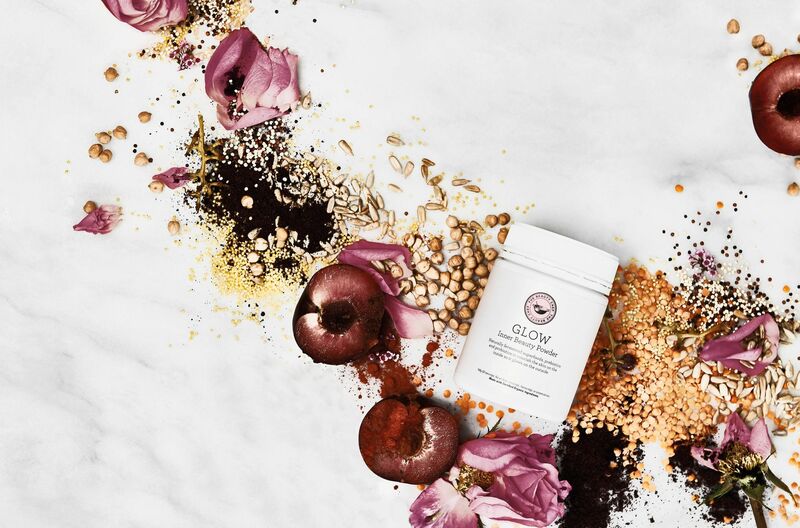 Drink your way to a brighter complexion and shinier hair with the Glow Inner Beauty Powder, which contains 24 bio-fermented superfoods loaded with skin beautifying vitamin C and antioxidants. The powder can be paired with the Collagen Inner Beauty Boost, a tonic that contains a blend of bio-fermented maqui berries, acai berries, blueberries, papaya and grape seed extract to boost collagen production for a plumper, smoother complexion. This natural California-based brand develops products using ingredients that are sustainable and locally sourced. They protect and nourish your skin with vitamins, natural phyto-protectors and age-defying antioxidants. Apply the Coola Primer first, followed by the Organic Makeup Setting Spray, which is rated SPF30 and will keep foundation and powder in place through tears, laughter and even a night of dancing. Sydney-based naturopath and nutritionist Anna Mitsios developed her brand, Edible Beauty, in 2014 when she realised her beauty cabinet was missing an organic range of products free from damaging chemicals such as sulfates, parabens, phthalates, alcohol, fragrance, propylene glycol, preservatives, colours and synthetics. Edible Beauty uses Australian wild-crafted botanicals alongside coconut oil, vitamins and natural antioxidants, and the entire range is 100 per cent vegan, earth-friendly and cruelty-free. Don’t forget your hair. Natural products work wonders on your locks, as proved by natural haircare brand Rahua. We love its Finishing Treatment, as it quickly repairs any hair that’s been sun damaged or coloured. It contains ungurahua oil, which is a conditioner and shine enhancer, quinoa, which fights frizz, and green tea leaf extract, which shields hair from UV rays. If you want evidence that Kora Organics works, look no further than the face of its founder, Miranda Kerr, who literally glows with health. For Kora, it’s all about the noni—an ingredient derived from the noni fruit, which is famous for healing the body both inside and out. Our favourite product? Noni Glow Face Oil, made from noni extract, pomegranate oil and sea buckthorn oil. Kerr cites it as her favourite product from the entire range due to its nourishing qualities, lack of synthetics and the radiant sheen it creates. This Austrian brand has been a world leader in natural and organic skincare since the 1960s, which has given it a few decades to perfect its products. Most of Dr Hauschka’s delicious smelling creams are centred around the nurturing powers of the rose—in particular rose wax, which forms a delicate and protective layer to prevent dryness, and rose petal extract, which fortifies the skin while helping it retain moisture. Modern life, as anyone addicted to their smartphone knows, can be more than a little exhausting. Which is why 8 Faces has borrowed from a range of ancient cultures to find the most soothing beauty rituals available. Amla berry, one of the brand’s key ingredients, has been used in Ayurvedic medicine for centuries. Bursting with a high natural concentration of vitamin C, this super-fruit is said to contain the highest content of antioxidants of any food in the world. It quickly revives tired or damaged skin when massaged slowly into the skin with a stone applicator.